← My valentine to ally parents, or why I will always choose love. I never would have guessed the way this turned out. I don’t mean that I never expected to have Autistic children. I mean I never would have guessed that I would be here, feeling the way I do today about Autism. It is true that I started in fear. Oh! I was afraid to begin! My fears were as wide as my ignorance. Empty too. With shaky steps and innumerable questions, the Mother in me set out to move from fear. Still walking this Autism journey, always will. Now, however, I walk in love. I looked up from my tears and saw my small children. They were quietly turning the pages of picture books. What was so wrong? Why was I over here, in fear? Why were they over there, in peace? That deep breath taken after the crying is over, I took it. The pain I felt, the things I thought I knew, the fear, just did not match the reality of my sons. They were sensitive, affectionate, funny, intelligent, and sure there were difficult times too, but they were not frightening. My children were loveable. Easily so. I was confused, mistaken, misunderstanding Autism. Love kept me moving. I began to meet the Autistic community, and those places that did not match up to my sons’ reality, did not match their Autistic reality either. I realized I would have to reject what I thought I knew about Autism, and relearn from them in order to get any where. I realized I could. I could walk away from fear and into understanding. The Autistic community gave me lessons on thepresumption of competence, inclusion, acceptance, empathy, self advocacy, glimpses of their lives to heal my ignorance, to drive out fear. Like a road map drawn from their experience, they loved my children enough to guide me on my way. All this love changed me. My heart grew fit as I traveled along. No longer could fear enter the chambers of me. Love beats too strong. I set down my conditions because they only blocked the way. I unpacked my ignorance because it pulls in the wrong direction. I dropped my fears one by one because what I have to carry is too precious to fumble. I made room for the love of Autism. I filled myself up with the love for Autistic people. I never would have guessed it, but it’s true. I did not have to begin in fear. I should not have been made to. My sons were not made to be feared. My sons are made of love. I know there are Mothers like me just taking their first steps in the journey of parenting Autistic children. I know. I know. I know what they are feeling. May they head in the right direction. May they follow their heart and not their fears. May they love it through. It is the best move to make for themselves, for their children, for all Autistic people, and for us all. May we walk in love together. Love not fear. 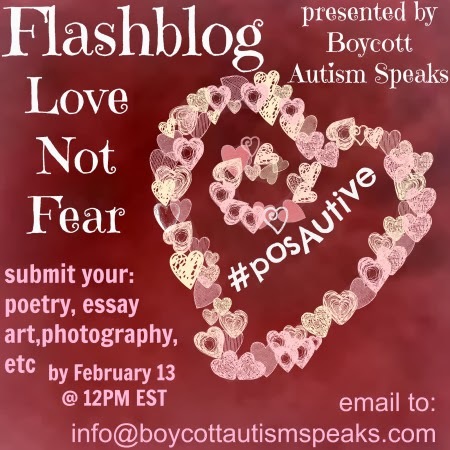 The preceding essay was written for the Boycott Autism Speaks sponsored Flashblog, #LoveNotFear. Please take the time to read more. Please Love.